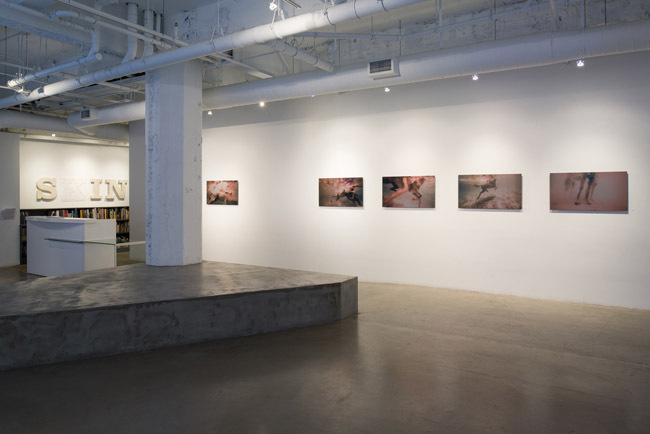 San Francisco — Gallery Wendi Norris presents Foreign Bodies, an exhibition of new work by Ana Teresa Fernández exploring how women navigate the geographic, social, and physiological boundaries between the United States and Mexico. Documenting her performances and installations using photography and the painted image, Fernández’s work reveals how women’s bodies become surfaces imprinted with political and social upheavals. Fernández’s visually complex and emotive photographic prints document the artist’s performance as she rode an iconic white horse in sinkhole waters in Mexico. The images are hauntingly rendered as direct prints to silver Dibond and depict Fernández and the horse as conjoined bodies. At times serene and other times franticly agitating the water that surrounds them, the underwater perspective of the horse and rider calls attention to the other-worldy, disorienting state of foreign environments. The horses’ bulging muscles and Fernández’s violent black stilettos express the combative nature of the artist’s bodily engagement with the animal, and further brings to bear the physicality of her experience. Fernández’s oil on canvas paintings record her performances at the United States and Mexico border, in which she filmed herself painting the fence separating the two countries. These works conflate the body of the artist as a political actor and as a creative force. Another exhausting, physical piece, Fernández used giant ladders to scale the boundary and was interrogated by authorities during the process. In painting the black bars of the fence to sky blue, the barriers between artist and political activist dissolve, just as the barrier between the countries seems to fade into the background. As the fence disappears into space, the “foreign” nature of the artist’s female body is further called into question. Fernández’s imagery connects the intimacy of a personal, physical encounter to a wider understanding of strength, vulnerability, autonomy, and authority. In this way, the white horse alludes to a wide history of declarations and disruptions of power, from its use in assertive portraits of Spanish conquistadors, to Picasso’s Guernica. Further, Fernández’s practice is in dialogue with contemporary artists such as Patricia Ruiz-Bayón, Tochiro Gallegos, and others contemplating and engaging the landscapes and residents of the border territories. Though Foreign Bodies emphasizes the artists’ own body as the “foreign” site of transgression and repression, it simultaneously inserts this individual experience into a wider political and historical context. Zora Neale Hurston’s analysis that a racial “other” is most vividly felt “when placed against a sharp white background” is crucial to Fernández’s aesthetic perspective. With her work in Foreign Bodies, Fernández presents the truth that women face at the border—their bodies are singular passports of “otherness,” to be stamped with the political and social violence of a foreign land.